An IWW leaflet produced in Seattle during the General Strike. Records - Industrial Workers of the World, Acc. 544, Box 3, UW Libraries. For a larger version of this image click here.The rise of the Washington State Communist Party is part of the story of American Communism. In 1919 the Socialist Party of America split apart and gave birth to not one but two communist parties. Inspired by the Bolshevik revolution and determined to affiliate with the new international Communist movement, one group of leftwing Socialists bolted and established the Communist Party of America (CPA), while another group of Reds tried to take over the Socialist Party, only to fail and be expelled. In September 1919 they established the Communist Labor Party (CLP). The new parties remained separate for almost two years. CPA, led by Charles E. Ruthenberg, was largely comprised of what had been the foreign-language sections of the old Socialist Party. The rival Communist Labor Party, led by John Reed and Benjamin Gitlow, attracted English-speaking radicals. Under pressure from the Communist International (Comintern), the parties merged in 1921, becoming the Communist Party USA (CPUSA), with Ruthenberg as leader. The Pacific Northwest seemed like fertile ground for the new movement. The region had long been recognized as a center of labor radicalism. The Socialist Party of Washington (SPW) had formed in 1901, and by 1912 was strong enough to elect city officials in a number of cities, including Seattle. The Industrial Workers of the World (IWW) also flourished in the cities and timber camps of the region and succeeded in pushing the rest of the labor movement and many Socialists to the left. Most of those who joined the SPW after 1912 allied with the "Red" (revolutionary) faction. That was especially the case among the Finns and other immigrant groups who maintained their own Socialist locals. Events of 1919 further demonstrated the region's radical potential. 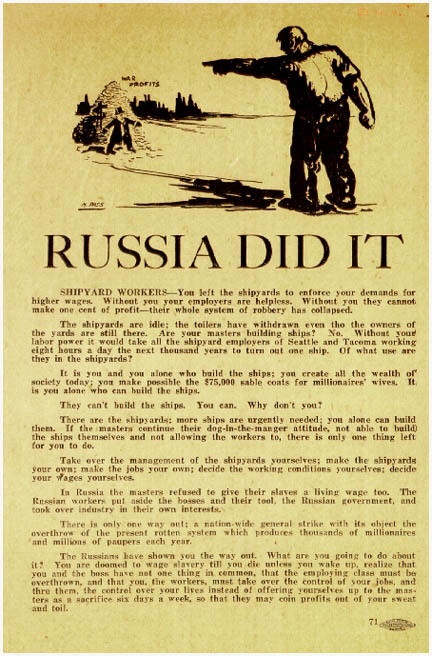 In February of that year the city of Seattle was shut down by a general strike that began in the shipyards and soon involved 60,000 workers. As the year progressed, other dramatic strikes spread across the country (e.g., Boston police strike, massive coal and steel industry strikes), creating a revolutionary romantic atmosphere that seemed to bode well for the new movement. Henry P. "Heine" Huff joined the Wobblies (IWW) in 1917. He saw and learned from the Centralia conspiracy struggle while working as a railroad switchman, and eventually joined the Communist Party on January 1, 1920 as a Charter Member (courtesy CPUSA online)Both these emotions are useful, but not too much of either. We are undertaking the most tremendous move ever made by LABOR in this country, a move which will lead-NO ONE KNOWS WHERE! 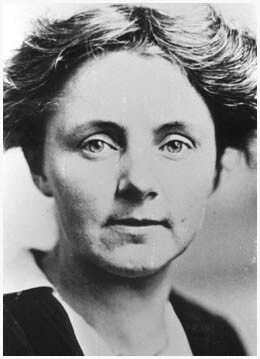 Anna Louise Strong left Seattle before the Communist Party even got a chance to take hold of labor politics. In 1921 she sailed to Europe and made her way to the Soviet Union, following her friend Lincoln Steffens' advice that she witness the revolution at first hand. Her departure was due also to her pessimism about the state of the labor movement and was a loss for the Party in Washington State. She could have been had a powerful ally who understood the plight of labor. Some of those who joined the two Communist Parties in the early 1920s were former Wobblies. Indeed, the Communists hoped to replace the IWW as the militant voice of the Left and worked hard to recruit in the lumber camps and skid-roads where the IWW had been strong. Henry "Heine" Huff, one of the new recruits, was a railroad switchman who joined the CLP in early 1920 and stayed a Communist for the next forty years. 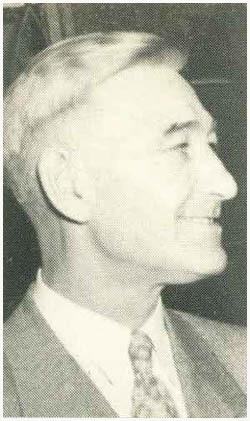 In the 1940s he became District Organizer, the top leadership position for the Party in the Northwest, and in 1953 he was among the eight Washington State Party leaders indicted under the Smith Act. The Party picked up where many of the dissolved radical groups left off in trying to become a powerful independent force, at the same time joining up with other labor organizations to influence them. Following along the lines of the old Socialist Party, the main goal of the Communists, particularly in Washington State, was to influence and dominate the labor unions and other organizations, hoping to eventually move the broader labor movement toward Communism through education and inside politics. 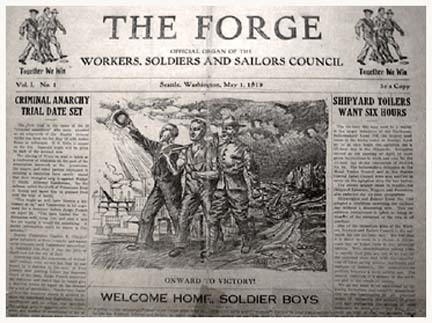 One of the first targets was the Union Record, owned by the Seattle Central Labor Council and the only labor-owned English-language daily newspaper in America. Joining with IWWs and other Reds, Communists attacked the editor, Henry B. Ault, as a "labor capitalist." Ault fought back, supported by most of the SCLC. "We will fight to the ultimate limit every attempt to turn this paper to either the IWW or the Communist Party," he editorialized. [viii] The radicals then formed a sixteen-member "Committee of 100"to rally radical support against Ault and labor-capitalists. They set up a weekly newsletter called Save the Record wherein they attacked the Record leadership, mailing editions to AFL members. The Union Record published its own newsletter to discredit the radicals. [ix] In the end, the radicals lost, but the fight had taken a toll on the labor movement as a whole. In a sense it was a small victory for the Left since it showed that Communists could have some leverage. And the days when Communists could openly participate in such coalitions were drawing to a close. From the onset, the WP had no direct control over any labor council nor was its membership in the councils large enough in numbers or in key positions to significantly change policy. It must also be emphasized that the majority of radical labor activity was not conducted by the Party alone but by unofficial communists, sympathizers, fellow-travelers and by other radical organizations like the IWW that shared certain leftwing beliefs with the Party. Still, the 1920s had laid the groundwork for what was to come. Even before the Great Depression struck, the Party was showing signs of renewed energy in the Pacific Northwest. A new group of organizers had emerged, including Noral, who would become District Organizer in 1931, and Fred Walker, assigned to breathe life into the District's Young Communist League (YCL) As 1929 dawned, Communists were once again active. Organizers were trying to build a new union of timber workers in camps and mill towns near Grays Harbor. Soap-boxers were appearing nightly on the streets of Seattle's skid-road, their meetings inevitably broken up by police. 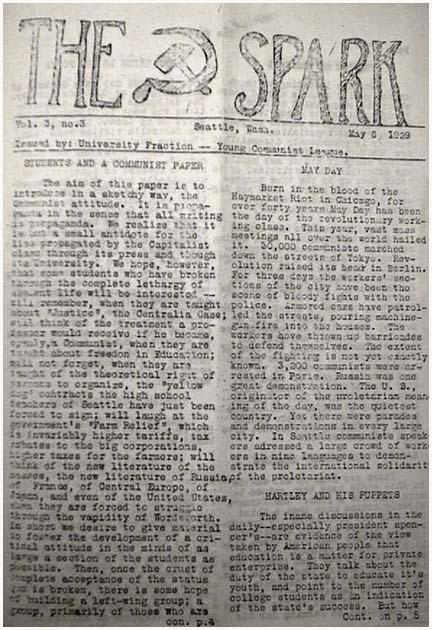 And on the campus of the University of Washington a small YCL group had reformed and were putting out a sprightly little newsletter called The Spark. [i]Jonathan Dembo, Unions and Politics in Washington State 1885-1935 (New York: Garland Publishing, 1983), 92. [v] Harvey Klehr, The Secret World of American Communism. (New Haven: Yale University Press, 1995), 7-9. [vi]Albert F Gunns, Civil Liberties and Crisis: The Status of Civil Liberties in the Pacific Northwest, 1917-1940. (Ph.D. dissertation, University of Washington, 1971), 95. See also copy in Litchman Collection, Box 1/7 and William M. Short, History of Activities of Seattle Labor Movement and Conspiracy of Employers to Destroy It and Attempted Suppression of Labor's Daily Newspaper, the Seattle Union Record (Seattle, n.d.); Xerox copy in William M. Short Collection, Special Collections, UW. 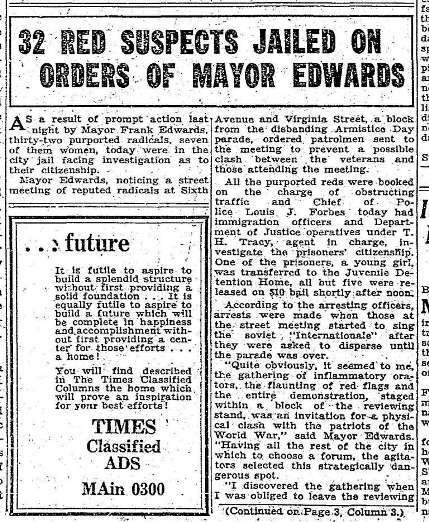 [vii]Red Suspects Jailed on Orders of Mayor Edwards,. "Seattle Times, 12 November 1929. [x]Ibid., 345. See also Cravens, 160; Union Record 4 May 1922; Litchman to Slater, 25 May 1922, Litchman Papers. [xi]Washington Secretary of State, Abstract of Votes 1922; Dembo, , 346-347. [xiii]Daily Worker 17 Feb. 1925; Paul Mohr Trial Transcript. 1925; G.W. Roberge to C.W. Doyle, 3 Feb. 1925, Box 6; J.N. Belanger, et al. to Building Trades Council, 13 Feb. 1925, KCCLC Records, Box 6..
[xv]Minutes, 4, 11, 18-25 Feb., 4, 18 March 25, Box 8; Freen to C.W. Doyle, 6 Feb. 1925; Report of Strike and Grievance Committee of the Trials of Delegate Price, Hansen, Carlson, Mohr, Havel, and Jones, 18 March 1925, KCCLC Records, Box 6..
[xviii]Minutes, 1 April 1925, KCCLC Records, Box 8. Minutes, 8, 15 April, 13 May, 8 July, 12 Aug. 1925; 12, 26 Jan., 27 July, 17 Aug. 1927; 2 Aug. 1933, Box 8; Resolution, 15 Jan. 1929, KCCLC Records, Box 6. [xix]Washington State Labor News 1925 Yearbook.